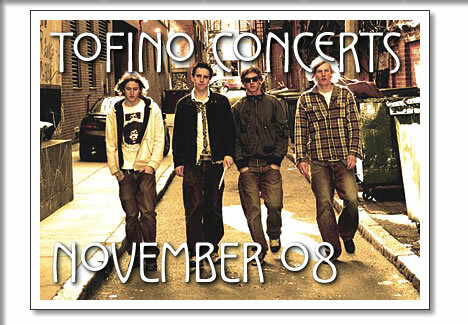 The following concerts in Tofino are happening in the month of November 2008. Tickets are available at Tofitian and Long Beach Surfshop in Tofino. Peter Brown has a reputation as one of the best keyboard players for pop, jazz and blues in the greater Ottawa area. He has been playing piano professionally for the past 25 years. Peter is a polished and soulful performer in styles ranging from Chicago blues to boogie to bebop to country. He is valued by the many bands he works with for his virtuoso 'chops', strong rhythmic drive, exciting solos, and the ability to support and inspire the musicians he plays with. Marc Atkinson is one of Canada's finest juno-nominated, Western Canadian award-winning musicians He is the leader and composer of the internationally renowned Marc Atkinson Trio with Joey Smith on bass and Reuben Wier or Chris Frye on rhythm guitar. The music of this virtuosic group is melodically captivating, sensually charged and ferociously, technically awe-inspiring.His catchy compositions, take guitar beyond the usual repertoire and sound. The tunes have a fiery but elegant guitar style, while maintaining the laidback humour and casual 'good time feel' of Canada's West Coast. The music of the Marc Atkinson Trio good-naturedly welcomes all listeners aboard for an intriguing, exhilarating and unforgettable ride. Vancouver Island based band Current Swell has a unique style of music that is deeply rooted in folk and blues, reggae inspired, and rock driven. The musical recipe is equal parts prairie and coastal, blending a couple of acoustic guitars, a lap slide, harmonica, drums, bass, and 4 vocal mics. This formula amounts to a tightly polished act and is pushing the boundary of what people know as new music. Current swell takes pride in growing as artists and songwriters in this ever changing business. With a widely growing fan base of people aged 16 to 60 alike, Current Swell has been dubbed as 'Ben Harper meets Sublime' by some. Tofino concerts in November 2008 from Tofino Time Magazine. Shows at the Tofino Legion and other music events in Tofino.